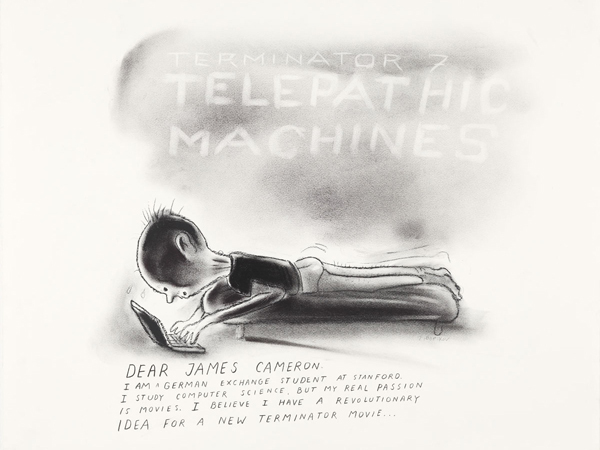 Jakob Boeskov: Weekend Futurology at Mulherin + Pollard | The Bottom Line "The Drawing Center"
Jakob Boeskov, Untitled (Dear James Cameron), 2012. Image courtesy of Mulherin + Pollard, New York. The future lies in the hands of James Cameron. Or so the suite of films and works on paper by Danish-Icelandic artist Jakob Boeskov (b. 1973) attempts to convince viewers of his exhibition Weekend Futurology, on view at Mulherin + Pollard Gallery through this Sunday. Boeskov’s crisp delivery of the future-present includes drawings of big bad Internet corporations, pulp sci-fi gadgets, and a lot of Xanax — all mixing lightly with the heavy air of paranoia. Drawing from the lexicons of science fiction, technology, and politics, Boeskov’s films and drawings reverberate with the same energy of the lunar landing, playfully critiquing the present state of society and technology along the way. Adapting the visual iconography of sci-fi classics like The Day the Earth Stood Still (1951), Boeskov creates a retro-sleek techno-eroticism. A pair of sexualized anthropomorphic search engines — part-furry with vintage digital screens — and a list of Florian Mann’s recent Wikipedia searches compile playful anecdotes of our mounting social and sexual dependence on internet technologies. The illustrative quality of many of the works hint at the artist’s comic-making background, and the text, drawn in a clean uppercase, delivers the dark humor punch line of many of Boeskov’s pictures. While the content of his drawings seduces viewers to contemplate Boeskov’s forecast for the future, his choice of the pastel medium engages with the history of art and drawing, filling his work with gleefully mischievous contradictions. Many works comment on the dehumanized state of society after the arrival of large Internet-based corporations like Facebook and Google; however, Boeskov is intent on delivering them a human punch. His loose, unpolished renderings of an Internet robot exacting retribution and carefully modeled diagram of a “Facebook gun” are equal parts dire and delightful. 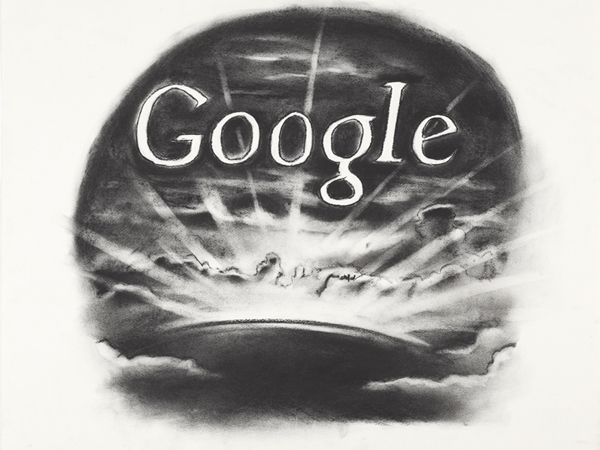 In one striking image, Untitled (Google) (2012), sculpted clouds shot through with rays from a dramatic sunset appear below the neon alien glow of the Google logo. The imperfection of the outlined letters collides with our associations of this pristine emblem of web design. Here, the artist’s hand reassures the viewer that at least one person believes that drawing cannot be outmoded. Jakob Boeskov, Untitled (Google), 2012. Image courtesy of Mulherin + Pollard, New York. Evidence amassed, Boeskov builds a case for his paranoia. Yet, his quick lines, casual misfires, and intentional cross-outs remind viewers that this is the work of a fevered weekend ruminator, the Star Trek child who still cherishes science fiction. The collection of drawings and films at Mulherin + Pollard invite anyone who has ever thought about their internet presence to embrace and question the future-present vortex, too.